This documentary tells the story of Drop City, the Colorado artists’ commune formed in 1965, which became an icon for a global counterculture. Directed by Joan Grossman; animations by Michael Krueger. 2012, 82 minutes. A discussion follows with the film’s director Joan Grossman, the animator Michael Krueger, and Drop City cofounder Gene Bernofsky. Artist and filmmaker Gene Bernofsky is one of the founding members of Drop City, one of the first countercultural communes in the United States. Taking inspiration from R. Buckminster Fuller’s geodesic domes, the group began building their own colorful, hand-hewn versions out of scavenged wood, salvaged metal car tops, and other detritus, which they “dropped” across a seven-acre plot of land they purchased near Trinidad, Colorado. Bernofsky’s artworks and papers are archived at the University of Kansas Research Library in Lawrence, and his work is included in the exhibition Hippie Modernism: The Struggle for Utopia. Brooklyn-based Joan Grossman is an independent media artist, producer, and scholar. Working across documentary and experimental nonfiction, she has made projects for cinema, television, museums, and the web. Her work has been screened and exhibited in more than 20 countries and has won numerous awards, with projects in Africa, China, Russia, and throughout Europe. Grounded firmly in drawing, Michael Krueger works in a variety of media, including painting, drawing, printmaking, animation, and ceramics. His work reflects a deep interest in American history, contemporary American culture, art history, the human experience, and personal memoir. Meditation is Not What You Think marks an unabashed departure for Krueger both in terms of the form and content of his work. 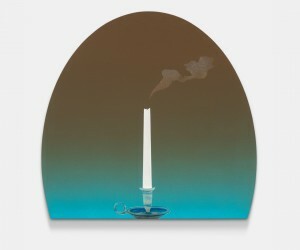 The exhibition features eleven new paintings that deal with the material and immaterial, images and non-images, each seeking moments of mediation. Krueger finds covert inspiration, form, humor and sensation in the struggle to unburden the mind, and clarity in the images that well up as one tries to meditate everything away. He embraces images that flicker off and on, repeat and refresh unfiltered. Only By Night is a meditation on the solitary experience of the world at night. Inspired by an Edgar Allen Poe poem, which alludes to the constrictions of nighttime dreaming. Only By Night features works whose images come alive after dark falls, when the world quiets, and we find ourselves with a moment to contemplate the day that came before and the life that looms ahead. The pause for reflection vibrates from a still room, to a quiet neighborhood, to the hushed landscape, to the magnitude of the entire universe. The work in Only By Night includes painting, printmaking, drawing, and photography representing both the restorative and haunting icons of nighttime existence; whimsical buffalos tramp across snow white pillows as if something from a dream; moons and planets are rendered in graphite and paint in surreal detail and sober asceticism; the haze of fireflies and softly lit houses captured from the lens of a camera recall summer evenings and the comfort of companionship, and a glowing red digital alarm clock painted in oil hints both at the anxiety of insomnia and the potential of the coming morning light. 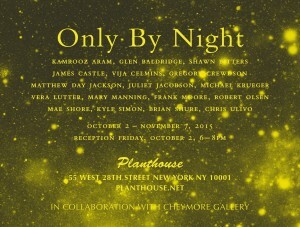 Works by Kamrooz Aram, Glen Baldridge, Shawn Bitters, James Castle, Vija Celmins, Gregory Crewdson, Matthew Day Jackson, Juliet Jacobson, Michael Krueger, Vera Lutter, Mary Manning, Frank Moore, Robert Olsen, Mae Shore, Kyle Simon, Brian Shure, and Chris Ulivo will be included in Only by Night. In collaboration with Cheymore Gallery. ​Featured artists include Ricky Allman, Corey Antis, Anthony Baab, Miki Baird, Laura Berman, Robert Bingaman, James Brinsfield, Shenequa Brooks, Keith F. Davis, Deanna Dikeman, David Ford, Nate Fors, Archie Scott Gobber, Corey Goering, Peregrine Honig, Matthew Kluber, Michael Krueger, Alex Kvares, Anne Lindberg, Marcie Miller Gross, Dylan Mortimer, Armin Muhsam, Garry Noland, Danni Parelman, Travis Pratt, Warren Rosser, Eric Sall, Russell Shoemaker, Mike Sinclair, Debra Smith, Davin Watne. 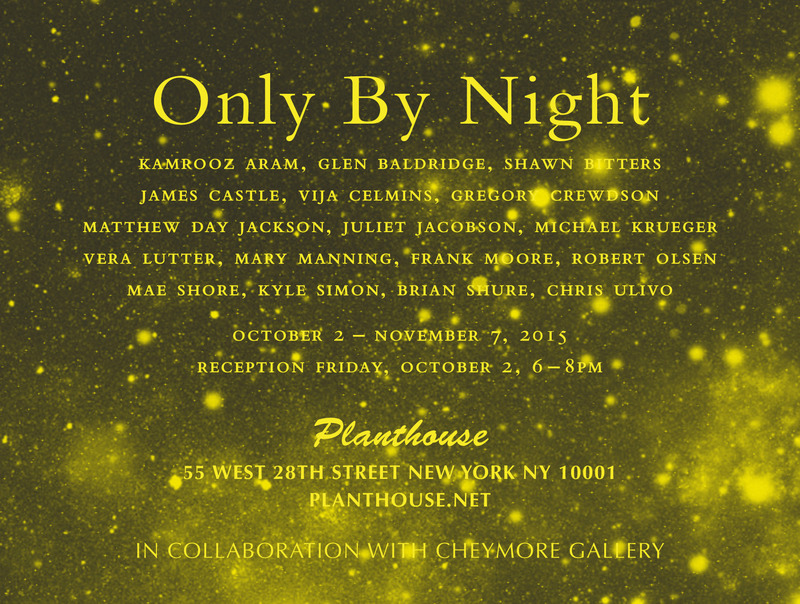 featuring works on embossed paper by 15 artists. Gallery Molly Krom is pleased to present Embossed, a group series curated by DUSK Series & Editions, featuring the work of 15 artists. With a firm belief in the collaboration and community building between gallery and artist, Gallery Molly Krom is transformed into an artist run space from July 9th to Aug 16th. Gallery Molly Krom’s programing has a focus on work on paper and this transfer of space represents a continuum in gallery’s aesthetics and beliefs. Both the gallery and Dusk are united by common aesthetic sensibilities and believe in promoting the work of artists with diverse history and exposure. DUSK Series & Editions is a print studio & gallery, curated and operated by artist Ky Anderson. Embossed started in the DUSK print studio by embossing paper in a consistent pattern. Designed and embossed by Ky Anderson the pattern was intended to complement each artist work while still challenging them, but subtle enough to not dominate the work. Some embraced the pattern, some found it wildly inspiring, some wanted more paper, some ignored the pattern while some repeated it, some struggled and some rejected the surface altogether and pulled out of the show. This series is a result of a group of artists with a knowledge and respect of one another’s work. While there are multiple approaches to the work they’ve allowed themselves to be further connected to one another by engaging in the consistency of the size and texture as their starting point. Embossed artists include Shane Drinkwater, Brian Edmonds, Sarajo Frieden, Benjamin Gardner, Yifat Gat, J Grabowski, Molly Herman, Michael Krueger, Emily Noelle Lambert, Meg Lipke, Jason Rohlf, Mason Saltarrelli, Ward Schumaker, Vicki Sher and Debra Smith. Please join us for the opening on July 9th from 6-8 pm. Opening the same night at the gallery next door, Frosch & Portmann, is Cosmicomics curated by Embossed artist Vicki Sher. Save the date and join us for a festive summer evening celebrating the work of many artists and two galleries who support the collaborative spirit of the artist gallery relationship. michael krueger - artist – us.